I enjoyed my egg so much last night that I had one again this morning for breakfast (with cream, onions, hot dogs, and red bell pepper). 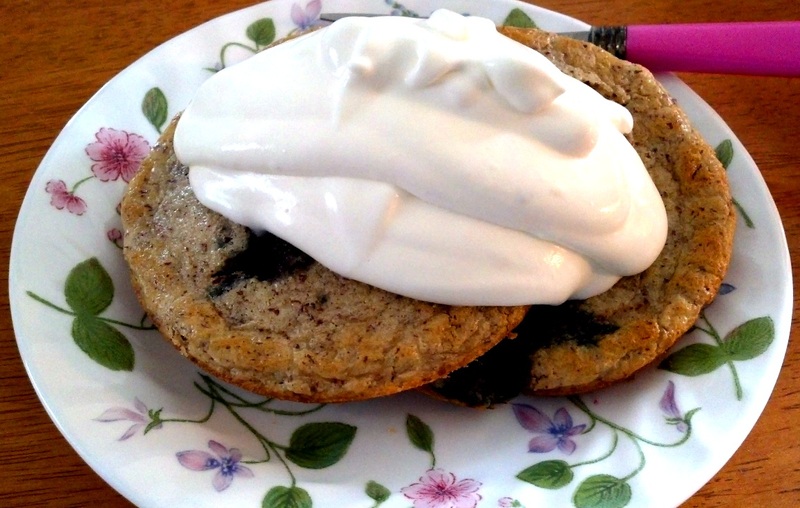 My daughter had been hoping to have waffles with blueberries and whipped cream for breakfast (though she ate the eggs without complaint), and we no longer had enough eggs to make waffles for lunch, so I decided to make blueberry-lemon scones. After popping them in the oven, I realized that I’d forgotten to add the blueberries! 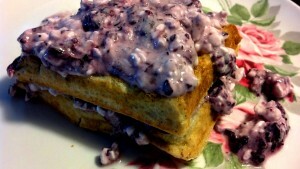 So I pulled them out and sprinkled the blueberries on top. Turned out fine. 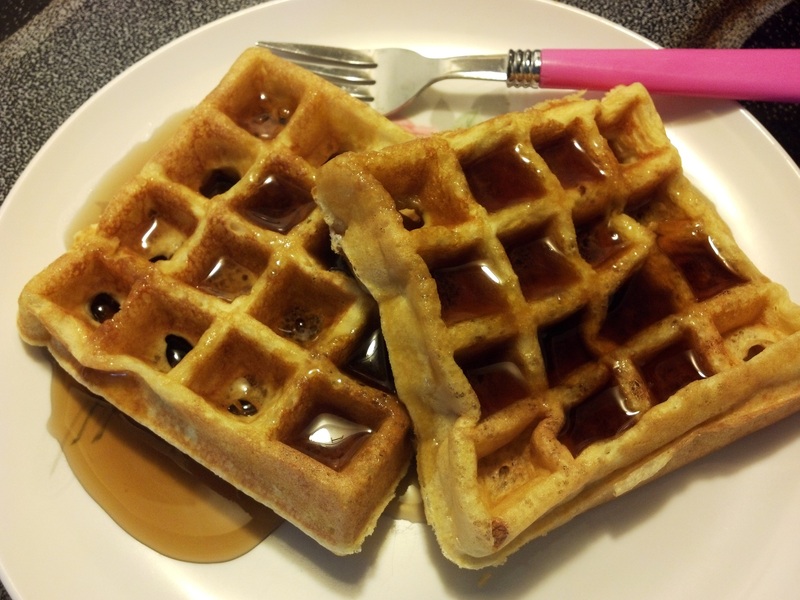 These were a little easier to make than waffles, though I think I prefer the waffles. My daughter insisted suggested that I make some whipped cream, so I made some with lemon extract. 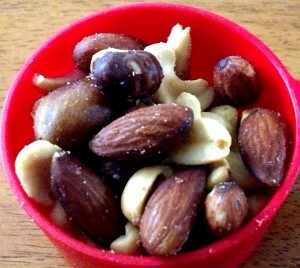 As a snack, I had some mixed nuts. I didn’t portion them out first, which I think is a mistake, but I didn’t go too crazy with them (I don’t think…but that’s the whole reason to measure first!). For dinner, I had intended to make chicken thighs, but I bought some chicken breasts that were marked down because they “expired” the next day. So I made those instead. I have trouble with chicken breasts. If I cook it long enough to feel that it’s done, it’s usually too dry. I don’t remember having this problem years ago, but lately I can’t seem to do a good job cooking chicken. Anyway, I diced it up in big chunks, and for ease of preparation and cleanup, I cooked them in the deep fryer. The manual recommended 2 to 3 minutes; I cooked them for 2:45. Wasn’t as juicy and tender as I’d hoped. So they needed sauce. 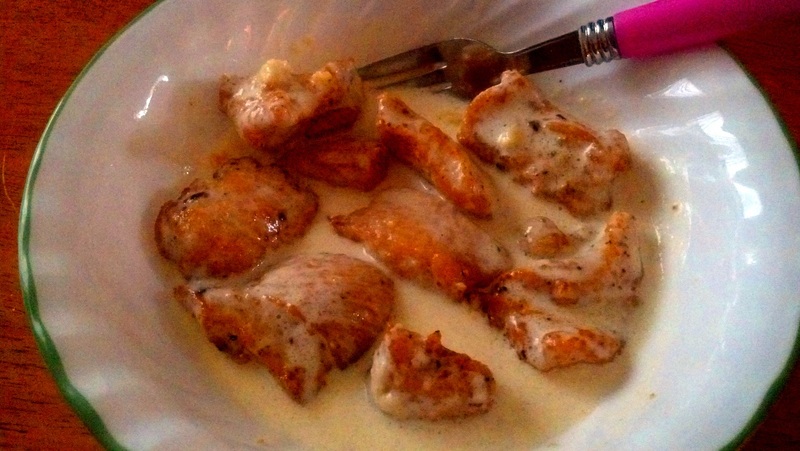 I’ve discovered that alfredo sauce is very quick and easy to make, so that’s what I had. It was a very good, textbook day of low-carbing, but the next morning I had gained two-tenths of a pound. Nothing to be concerned about, I’m sure. This put me at exactly eight pounds lost for my first week of low-carbing. 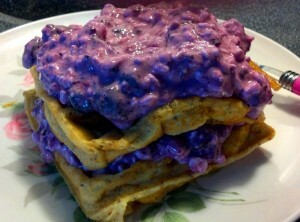 The indexing bots are going to think this is a blog about blueberry waffles. Nevertheless, that’s what I had for breakfast again this morning: a low-carb waffle topped with thawed blueberries and sucralose-sweetened whipped cream. I only had enough batter left for one waffle, but that was okay. 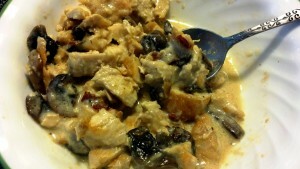 For lunch I had leftover swiss-bacon-mushroom chicken soup from last night. 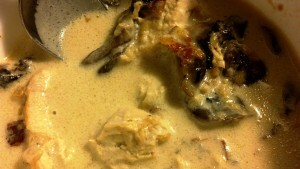 There wasn’t too much of the “soup,” left, though; it was mostly just chicken and mushrooms. For dinner, my husband announced that he wanted hot dogs since we had some bread (a rarity in our house, even though he hasn’t been low-carbing). I thought long and hard about what my daughter and I (she started low-carbing with me) could eat our hot dogs on. I didn’t really feel like baking some kind of low-carb buns (I had a headache, which I believe was hormonal, not ketotic, since I’ve been solidly in ketosis for a number of days). Fortunately, she decided to eat leftovers of the chicken, so I didn’t have to worry about her. I saw a video of Julia Child cooking an omelet a few days ago, and she made it look so good, I’d been craving eggs ever since (even though I generally don’t like eggs I’ve personally cooked). 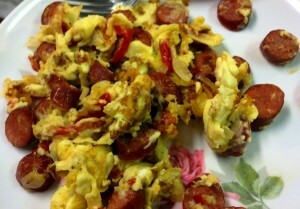 I decided to cut up some hot dogs and cook them with an egg. Yeah, I like that kind of thing! To punch it up a bit, I added some onion and red bell pepper, which I cooked until the onion was starting to caramelize. 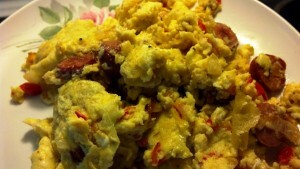 I only used two eggs (albeit jumbo ones), a little cream, and salt and pepper. Much to my surprise, I loved it! It was so good, I wished I’d made three eggs. My picky, non-vegetable-eating son saw me cooking it (and smelled it), and he asked if he could have the same thing, but without vegetables. He loved it, too (it helped that we were using good hot dogs, and I’m sure he got some of the nice onion flavor leftover in the pan). 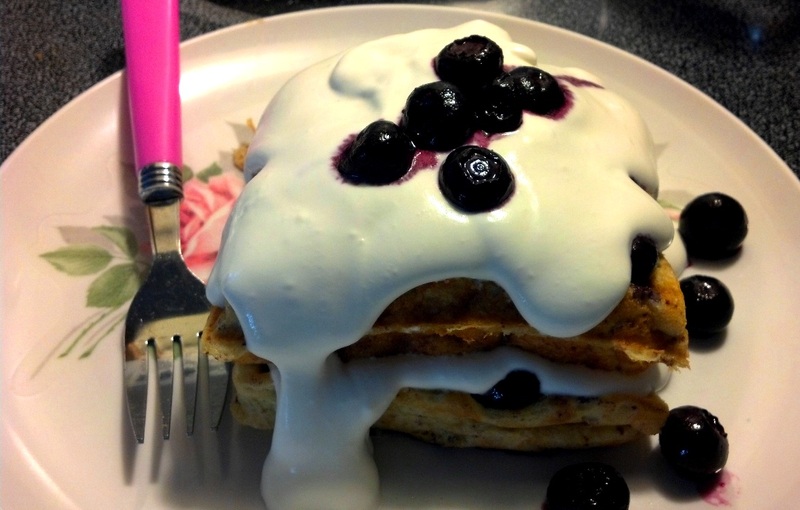 After dinner, my daughter asked if we could have some more whipped cream, so later on I made some and mixed in blueberries. 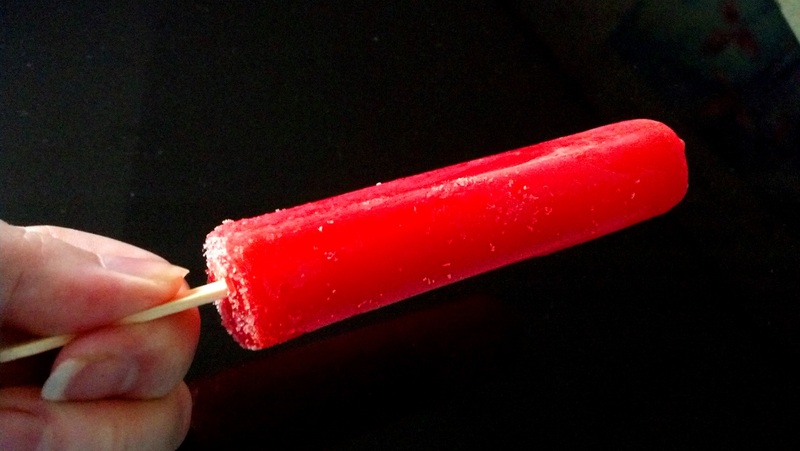 It made for a great bedtime snack, and the next morning I didn’t wake up hungry. And I’d lost six-tenths of a pound. I didn’t eat very much for dinner last night, so I quickly became quite hungry once I got up this morning. I still had batter in the fridge, so I made low-carb waffles again. 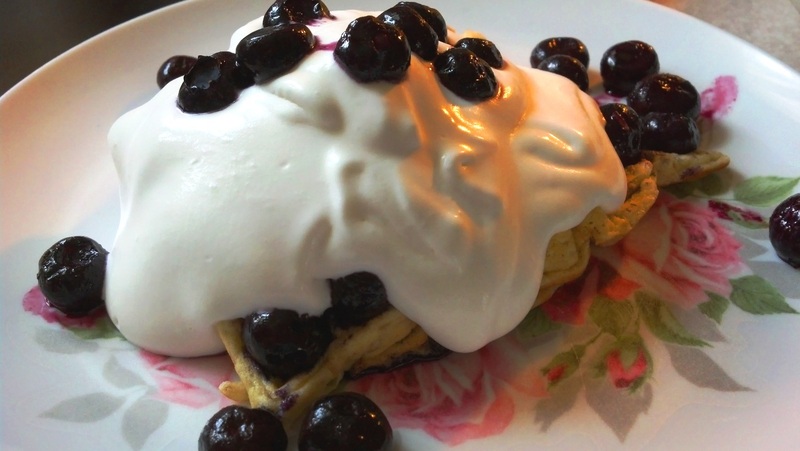 This time I layered them with homemade whipped cream and thawed blueberries (Costco sells bags of these much cheaper than you can get them fresh; and they’re available year-round). I think I put a little too much EZ-Sweetz in the whipped cream. I was thinking about the blueberries needing the sweetening, but they were actually quite good by themselves. At lunchtime I wasn’t really hungry, but I could tell my stomach was empty and I needed to eat something, so I had about 1/3 of a cup (1.7 ounces…I measured) of mixed nuts. For dinner, I made a rich chicken soup. Actually, it was going to just be chicken breasts with a swiss cheese, bacon, and mushroom sauce on top, but there was a lot of sauce, and it was kind of thin, and I didn’t want to spring for the carbs in cornstarch. When my daughter suggested that I cut up the chicken and serve it as soup, I counted my blessings for having such a brilliant child. 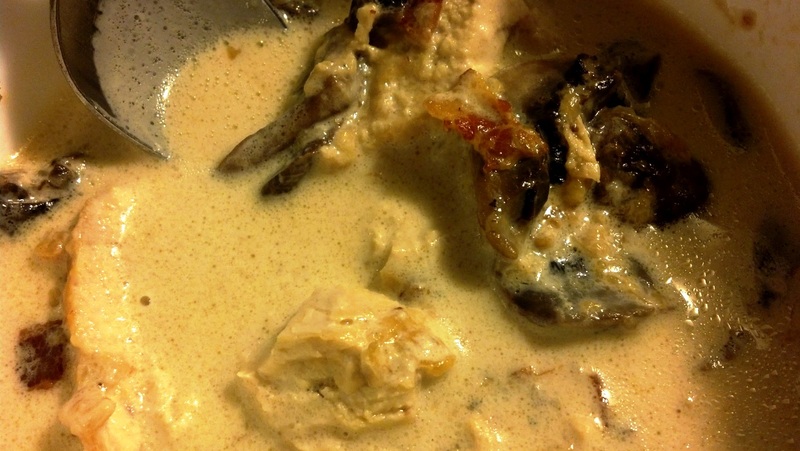 The “soup” part is made with heavy cream with just a little water from cooking the chicken (plus all the chicken fat and the oil I used for browning it, and a few tablespoons of butter that I browned the mushrooms and onions in) and half a pound of swiss cheese. It was very rich! I loved it, but I could only eat about half a bowl. Update: The next morning, I’d dropped almost three pounds. I had low-carb waffles layered with cottage cheese mixed with blueberries (sweetened with several drops of EZ-Sweetz) again this morning. I needed to use up the cottage cheese, plus I tend to eat something several times in a row if I really like it. 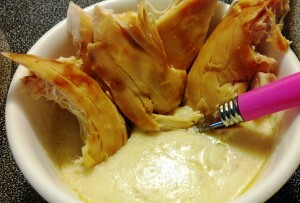 So, not surprisingly, for lunch I had alfredo sauce with rotisserie chicken left over from last night. Afterwards, I had a spoonful of natural peanut butter. 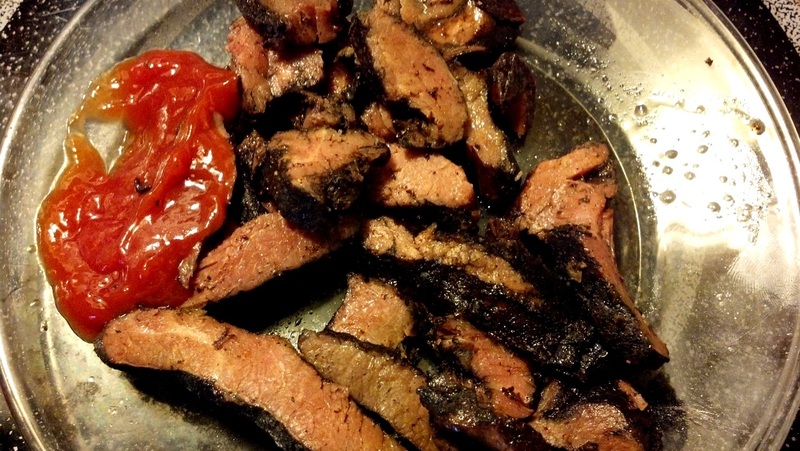 For dinner I had some packaged, pre-cooked strips of steak from Costco with some ketchup. Unfortunately, I’m out of low-sugar ketchup, so I picked up a few unnecessary carbs here, but not enough to worry about. This is a small, dessert-sized plate, by the way. When I’m low-carbing, I find that it doesn’t take nearly as much to fill me. Afterwards, I had a sugar-free cherry Popsicle. Update: The next morning, I had gained two-tenths of a pound. I don’t necessarily consider this an indictment of what I ate this day; I know I’m going to see disheartening (and totally unjustified!) fluctuations like this. That’s okay. Losing weight is only a nice side benefit to eating low-carb. My primary objective is the health benefits. 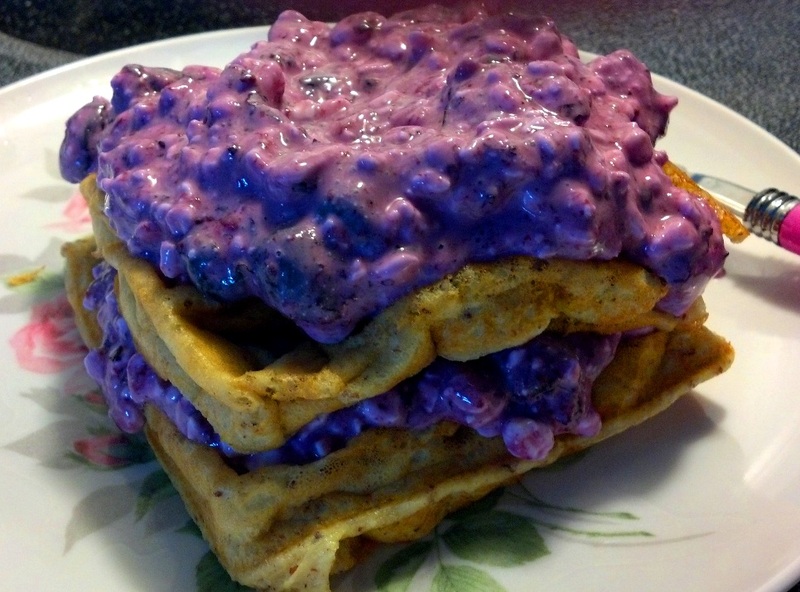 I started off the day with low-carb waffles, cottage cheese, and blueberries. For lunch, I had about a quarter or a third of a cup of leftover homemade alfredo sauce (by itself). For dinner, I bought a rotisserie chicken from the store. I ate all the skin off it, then had a few ounces of it dunked in alfredo sauce. I also had several black olives on the side because I have a tradition of always eating olives with rotisserie chicken. Update 8/12: This was only my third day of low-carbing (this time). I lost four-tenths of a pound for my effort.